This guided tour explores the hills, plains and historic towns of the southern Alentejo before crossing into the Algarve and ending at the ancient port of Lagos. 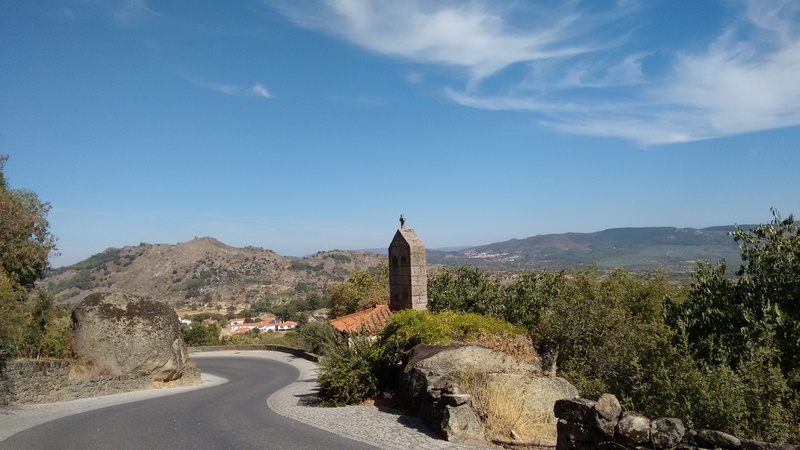 Following the success of the three routes we launched in 2016, our latest cycling tour takes in the landscapes of the two southernmost regions of Portugal. We’ll be there in early spring (in time for the first wildflowers but ahead of most other tourists) and in late autumn when the days are still generally sunny and warm. 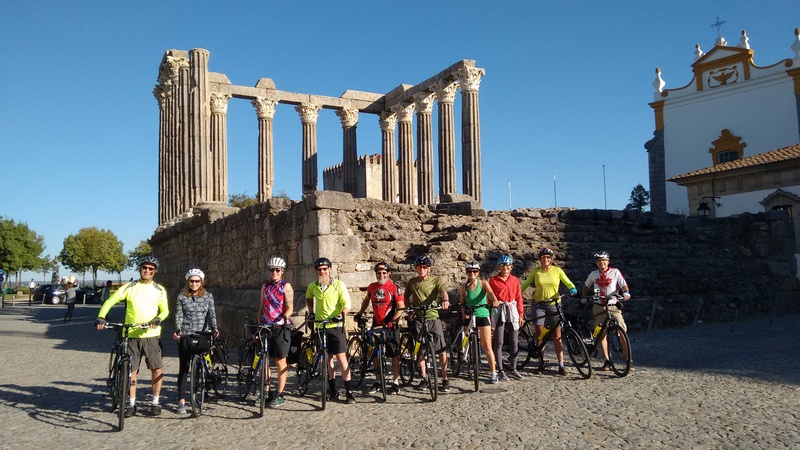 My wife and I will lead a small group of cyclists – maximum 10 riders – on a journey from the open expanses of the Alentejo, through the hills along the southern edge of this region and across country through the Algarve to the historic riverside port of Lagos. Scroll down to read more about the Southern Explorer. You can also see what riders thought of this and other previous tours on our Reviews page. For further news and other information on biking in Portugal you can also check out the Pedal Portugal Facebook page and blog. “We finished the Southern Explorer a few days ago and our experience was as wonderful as last year’s Border Castle tour. “Fabulous scenery, excellent accommodations, delicious food, great fellow riders and exceptional guides.” Barb Jarvis, Canada. 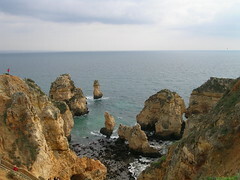 This tour offers an opportunity to explore some of the highlights of southern Portugal. We run the tour in early spring and late autumn. We can’t guarantee sunshine and dry weather but you’re more likely to enjoy pleasant riding conditions here than anywhere else in Europe or North America at these times of year. 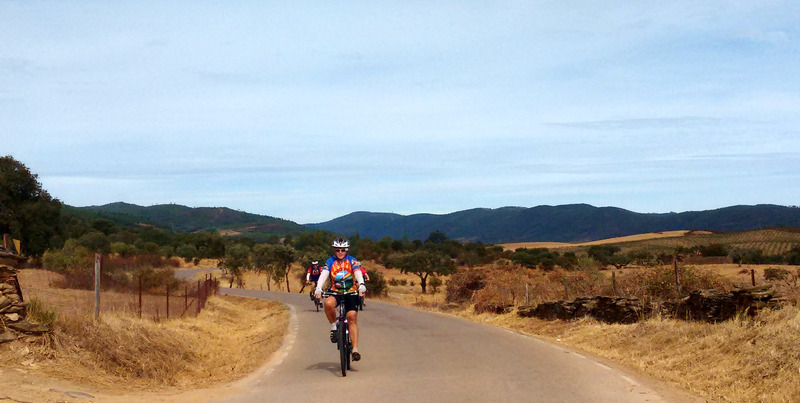 The majority of the tour is across the southern half of the Alentejo, which offers some of the best terrain for touring cycling anywhere in Portugal. There are no big mountains but a mix of hills and rolling countryside. This is one of the least-populated parts of Portugal and you’ll stay in a selection of small provincial towns, all rich in history and sights but mostly well off the normal tourist trail. Agriculture is still one of the Alentejo’s few major industries and you will ride for hours past vast swathes of pasture and grain fields, plus areas of cork oaks, olive plantations and vineyards. Birdwatchers will be able to keep their eyes peeled for a wealth of avian life – from eagles to bee-eaters and storks to hoopoes. 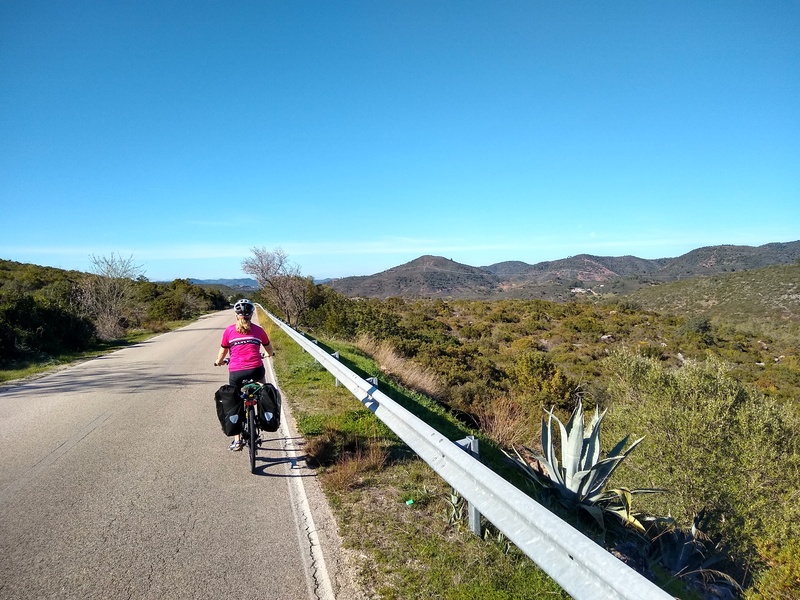 The last two days of the tour see us cross the hills that divide the Alentejo and the Algarve, following a scenic route that takes in some quiet countryside and a number of small villages and towns before arriving at the beach for our ride into Lagos. In terms of distance, the daily rides range from 50-68km (32-42 miles). There are no major mountain ranges involved but the ride is not flat and there is a reasonable amount of climbing on most days. In terms of climate, the Alentejo sees some of the highest summer temperatures in Portugal but spring (late February-early May) and late autumn (October onwards) are the best times for biking in the region. Please note: all pictures used on this page are of roads/locations on the tour and taken on previous visits to the region. The tour does a loop through the south-east of the Alentejo region, going almost to the border with Spain before turning west to follow the hills that separate the Alentejo from the Algarve. After turning south, we cross the border with the Algarve and drop down towards the coast before turning west again for our final ride to Lagos. We will ride across rolling plains, through rugged hills and along a dramatic coastline, staying in historic towns with sights dating from Roman, Moorish and medieval times. Day Eight (Sunday): enjoy a morning’s ride out from Mértola – or take a rest day and explore the museums and cobbled streets of this historic town. There are also marked walking trails in the surrounding hills for anyone wanting to stretch different muscles. Coffee and cake stops will also be an important part of the day! 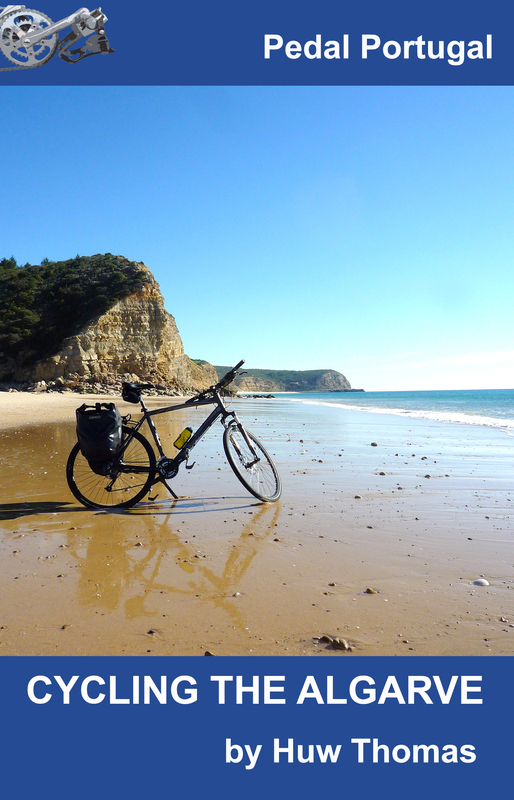 We cycled perfectly planned routes…ate outstanding local cuisine, and there was always that little extra – like when we were serenaded by three locals who blew us away with Alentejo folk songs.” John Adomonis, Canada. The tour costs €1,420 (2019 price) per rider – which works out at about £1,268 or $1,750 US for the 2019 price at current exchange rates (February 2018). ***Transfers: We will book train travel from Lisbon to Évora on Day One and to Faro on Day Twelve if required. We can also advise on bus and/or rail travel for any riders travelling on other days or from/to different destinations. Wherever possible, if anyone is unable to ride I will try to take them in the support vehicle. However, the support vehicle is not intended for taking passengers. For any riders who chose not to cycle, I can make arrangements with a taxi or bus but any costs will be additional. The 2019 hire prices for this tour are €200 for a road touring bike and €195 for a suspension touring bike, including delivery and collection (not including any accessories). Prices for other bicycle models will be confirmed at the time of booking. For more details, see bike hire page. For anyone wanting additional accommodation, either before or after the tour, we can book this for you or suggest various options but this would be an extra cost. We’re long-term supporters of the disaster relief organisation ShelterBox and donate £15 to the charity for every rider who joins this or any of our other tours. Read what previous riders thought on our reviews page (scroll down to find comments specifically on this tour). You can also continue to the bottom of this page for more pictures from previous Southern Explorer trips. Otherwise, please read our full terms and conditions before completing the booking form.